The Brethren & Mennonite Heritage Center (BMHC) shares and celebrates the historical and spiritual legacies of Brethren and Mennonites in the Shenandoah Valley. Coming from the same communities in Europe and Pennsylvania, Brethren and Mennonites have lived side by side in the Shenandoah Valley for more than two centuries, but they have truly been the “quiet in the land.” At the Brethren & Mennonite Heritage Center, the creative labor of these farmers and craftsmen and the unique forms of Christian piety and faith that have been largely invisible are brought into focus for tourists and pilgrims alike. The Brethren and Mennonite faith traditions emphasize peace and non-violence, the priority of spiritual over material values, disaster relief and voluntary service, care for neighbors, stewardship of the land, and the role of the faith community in discernment and practice. At the Brethren & Mennonite Heritage Center, visitors and volunteers alike engage with these values and faith traditions through stories, artifacts, historic buildings, and experiential learning opportunities presented as an invitation to current and future generations to seriously reflect on the shared values and heritage of the Brethren and Mennonites in the Shenandoah Valley. 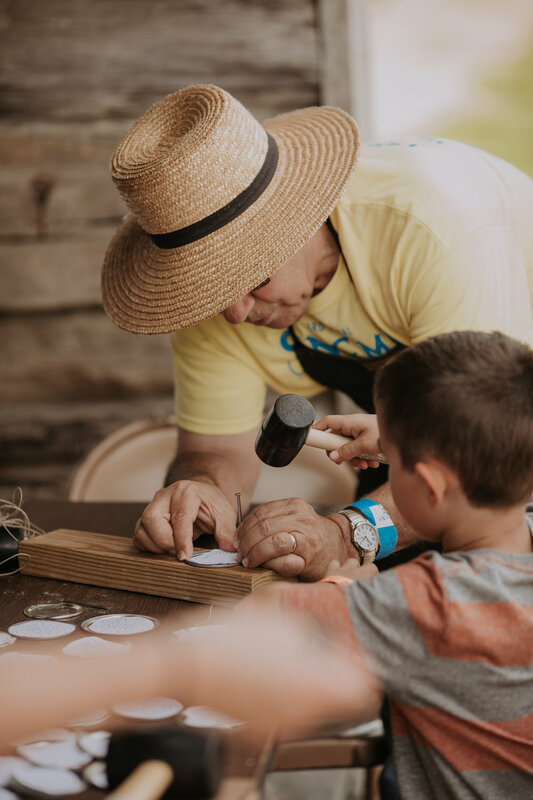 During the spring and fall, the Brethren & Mennonite Heritage Center campus fills with elementary age school children and their teachers, parents, and chaperones to experience life on a 19th century farmstead with hands-on activities like washing clothes, carpentry, churning butter, and cranking homemade ice cream. Throughout the year, the Brethren & Mennonite Heritage Center hosts and facilitates a rich program of special events including: lectures, summer evening vespers worship services, hymn sings, a Christmas event, and the annual Sing Me High Music Festival. Each event serves to strengthen the Brethren and Mennonite faith communities, as well as welcome all into conversation and reflection on the shared values and lived experiences of Brethren and Mennonites. The Easter Sunrise Service is an annual tradition hosted by the Brethren & Mennonite Heritage Center in partnership with Weavers Mennonite Church and Harrisonburg First Church of the Brethren. Join us just a bit before sunrise for this peaceful and reflective service in a beautiful natural setting. The service is short so those attending can also attend the regular services of their own congregations. The Sing Me High Music Festival celebrates music and faith in the Shenandoah Valley. Join festival hosts Brethren & Mennonite Heritage Center and the Walking Roots Band for the 4th annual Sing Me High Music Festival, August 23-24, 2019, to listen, sing, laugh, eat, and play — all while celebrating family, friends, and faith, whatever your tradition. Every December, hundreds of residents of Harrisonburg City and the surrounding Rockingham County make A Heritage Christmas part of their Christmas traditions. The small strength and beauty of candles in the still and silent darkness allows visitors a respite from the hubbub of commercialized Christmas chaos as they reflect on the experience of Advent preparations as they might have taken place 100 years ago. Join us this year on December 14 from 2 PM to 6 PM. Admission fees (adults - $10, students - $5, children 5 and under - free) support the ongoing work of the Brethren & Mennonite Heritage Center. In addition to the traditional candlelight tour, this year's celebration includes hands-on family crafts, live music and singing, and wonderful holiday refreshments. The mission of the Brethren & Mennonite Heritage Center is to share and celebrate the story of Jesus Christ as reflected in the lives of the Brethren and Mennonites in the Shenandoah Valley. Through stories, artifacts, and events, we welcome and encourage all peoples to seriously reflect on the shared values and lived experiences of Brethren and Mennonites. We emphasize peace and non-violence, the priority of spiritual over material values, disaster relief and voluntary service, care for neighbors, stewardship of Creation, and the role of the faith community in discernment and practice.